Facebook shares hit $45 a few minutes after they started trading on May 18, 2012. It's been a long climb back. But the stock finally topped $45 to hit a new all-time high. It's been a bumpy ride for Facebook since its initial public offering. But the stock has finally hit a new all-time high. Facebook (FB) surpassed $45 on Wednesday, a level that it briefly hit on its first day of turbulent trading on May 18, 2012. The stock rose 3% to a new all-time peak of $45.09. But shares pulled back a bit later in the day and closed at $45.04. Shares have rallied 70% since the social media giant reported second quarter earnings in late July. Facebook had been a big disappointment to investors last year. Shares fell as low as $17.55 on worries about Facebook's mobile strategy. But investors have become increasingly optimistic about the social media giant's prospects in mobile, which is expected to be a key driver of its future growth. Facebook generated 41% of its total advertising sales from mobile. A year ago, that figure was zero. At the time of the company's IPO, Facebook's strategy for generating mobile revenue was unclear, despite the rapidly growing number of people who access the site on their mobile phones and tablets. That's why topping $45 is a huge psychological milestone for the company and its investors. At $45 a share, Facebook's founder and CEO Mark Zuckerberg's stake is worth roughly $22 billion. Chief operating officer Sheryl Sandberg's shares are worth $637 million. (She sold some of her holdings earlier this year at $38 a share). 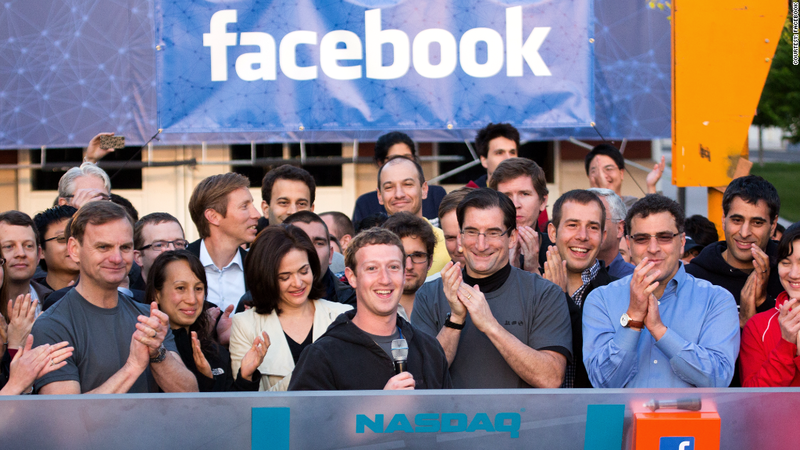 Facebook's IPO was the largest tech IPO in history and generated $16 billion in proceeds. But the IPO was marred by a trading glitch at Nasda (NDAQ)and complaints that its main underwriter, Morgan Stanle, (MS)had inflated the IPO price to curry favor with Facebook's management. Many investors clamored for shares of Facebook ahead of the offering. It was the most widely hyped IPO since Google (GOOG) in 2004. Even though Facebook is now finally living up to that hype, some experts think that Facebook is trading at elevated levels. At $45, Facebook trades at roughly 47 times its 2014 profit forecasts. Google and Apple (AAPL) trade at just 11 and 17 times their 2014 projections respectively. Facebook's valuation looks sane though when compared to LinkedIn (LNKD), Wall Street's other social media darling. Shares of LinkedIn are now trading at 116 times 2014 earnings estimates. Can Facebook keep up the momentum? Most Wall Street analysts think so. 29 of 32 analysts that cover the company have a buy rating on the stock.